The immediate successor of Pope Silvester, Arcus, ruled the Roman Church for only a very short period — from 18 January to 7 October, 336 — and after his death the papal chair remained vacant for four months. What occasioned this comparatively long vacancy is unknown. On 6 Feb., 337, Julius, son of Rustics and a native of Rome, was elected pope. His pontificate is chiefly celebrated for his judicious and firm intervention in the Arian controversies, about which we have abundant sources of information. After the death of Constantine the Great (22 May, 337), his son Constantine II, Governor of Gaul, permitted the exiled Athanasius to return to his See of Alexandria (see ATHANASIUS). The Arians in Egypt, however, set up a rival bishop in the person of Pistus, and sent an embassy to Julius asking him to admit Pistus into communion with Rome, and delivering to the pope the decisions of the Council of Tyre (335) to prove that Athanasius had been validly deposed. On his side Athanasius likewise sent envoys to Rome to deliver to Julius a synodal letter of the Egyptian bishops, containing a complete justification of their patriarch. On the arrival of the Athanasian envoys in Rome, Macarius, the head of the Arian representatives, left the city; the two remaining Arian envoys, with the Athanasian deputies, were summoned by Pope Julius. The Arian envoys now begged the pope to assemble a great synod before which both parties should present their case for decision. Julius convened the synod at Rome, having dispatched two envoys to bear a letter of invitation to the Eastern bishops. Under the leadership of Eusebius, who had been raised from Nicomedia to the See of Constantinople, the Arian bishops had meanwhile held a council at Antioch, and elected George of Cappadocia Bishop of Alexandria in the place of Pistus. George was intruded forcibly into his see, and Athanasius, being again exiled, made his way to Rome. Many other Eastern bishops removed by the Arian party, among them Marcellus of Ancyra, also came to Rome. In a letter couched in haughty terms, however, the Arian bishops of the party of Eusebius refused to attend the synod summoned by Julius. The synod was held in the autumn of 340 or 341, under the presidency of the pope, in the titular church of the presbyter Vitus. After a detailed examination of the documents, Athanasius and Marcellus of Ancyra, who had made a satisfactory profession of faith, were exonerated and re-established in their episcopal rights. Pope Julius communicated this decision in a very notable and able letter to the bishops of the Eusebian party. In this letter he justifies his proceedings in the case, defends in detail his action in reinstating Athanasius, and animadverts strongly on the non-appearance of the Eastern bishops at the council, the convening of which they themselves had suggested. Even if Athanasius and his companions were somewhat to blame, the letter runs, the Alexandrian Church should first have written to the pope. "Can you be ignorant," writes the pope, "that this is the custom, that we should be written to first, so that from here what is just may be defined" (Julii ep. ad Antiochenos, c. xxii). After his victory over his brother Constantine II, Emperor Constans was ruler over the greater part of the Empire. He was entirely orthodox in his views, and, at the request of the pope and other Western bishops, interceded with his brother Constantius, Emperor of the East, in favour of the bishops who had been deposed and persecuted by the Arian party. Both rulers agreed that there should be convened a general council of the Western and Eastern bishops at Sardica, the principal city of the Province of Dacia Mediterranea (the modern Sofia). It took place in the autumn of 342 or 343, Julius sending as his representatives the priests Archidamus and Philoxenus and the deacon Leo. Although the Eastern bishops of the Arian party did not join in the council, but held their assembly separate and then departed, the synod nevertheless accomplished its task. Through the important canons iii, iv, and v (vii in the Latin text) of this council, the procedure against accused bishops was more exactly regulated, and the manner of the papal intervention in the condemnation of bishops was definitely established. At the close of its transactions the synod communicated its decisions to the pope in a dutiful letter. Notwithstanding the reaffirmation of his innocence by the Synod of Sardica, St. Athanasius was not restored to his see by Emperor Constantius until after the death of George, the rival Bishop of Alexandria, in 346. Pope Julius took this occasion to write a letter, which is still extant, to the priests, deacons, and the faithful of Alexandria, to congratulate them on the return of their great pastor. The two bishops Ursacius of Singidunum and Valens of Mursia, who, on account of their Arianism, had been deposed by the Council of Sardica, now made a formal recantation of their error to Julius, who, having summoned them to an audience and received a signed confession of faith, restored to them their episcopal sees. Concerning the inner life of the Roman Church during the pontificate of Julius we have no exact information; all agree, however, that there was a rapid increase in the number of the faithful in Rome, where Julius had two new basilicas erected: the titular church of Julius (now S. Maria in Trastevere) and the Basilica Julia (now the Church of the Twelve Apostles). Beside these he built three churches over cemeteries outside the walls of Rome: one on the road to Porto, a second on the Via Aurelia, and a third on the Via Flaminia at the tomb of the martyr St. Valentine. The ruins of the last-mentioned have been discovered. The veneration of the faithful for the tombs of the martyrs continued to spread rapidly. Under the pontificate of Julius, if not earlier, catalogues of feast-days of saints came into use — the Roman feast-calendar of Philocalus dates from the year 336. Through St. Athanasius, who remained in Rome several years subsequent to 339, the Egyptian monastic life became well-known in the capital, and the example of the hermits of the Egyptian deserts found many imitators in the Roman Church. 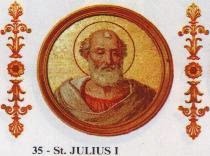 Julius died on 12 April, 352, and was buried in the catacombs of Calepodius on the Aurelian Way, and, very soon after his death, was honoured as a saint. His body was later transported to S. Maria in Trastevere, the church which he had built. His feast is celebrated on 12 April.